The Center for Food Safety, a nonprofit critical of biotech crops, considers the ruling a “big win” but expects the plaintiffs will challenge it before the 9th U.S. Circuit Court of Appeals, said George Kimbrell, senior attorney for the group. Under the ordinance, farmers who already have genetically engineered crops can harvest this year but must remove the crops within 12 months. 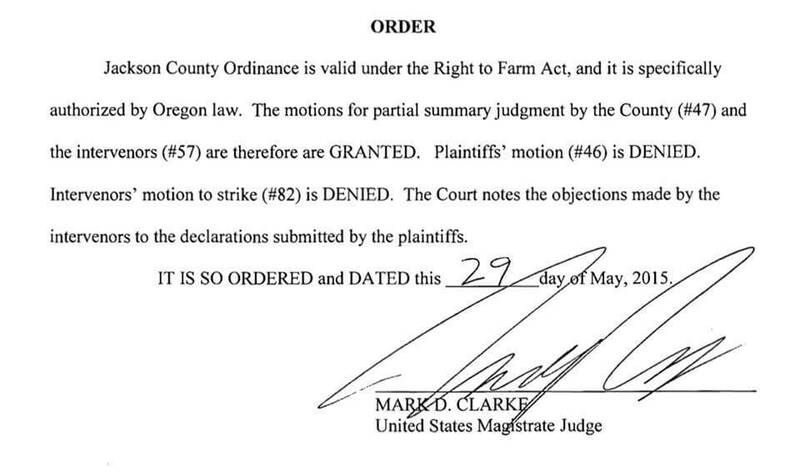 While Clarke has dismissed the farmers’ arguments regarding “right to farm,” their claim seeking $4.2 million in compensation from Jackson County remains alive in the case. The growers argue that forcing them to remove about 300 acres of herbicide-resistant “Roundup Ready” alfalfa amounts to the county condemning their property for public use, which requires just compensation. On May 20, 2014, 66% of Jackson County voters cast their votes to ban the growing of genetically engineered crops in Jackson County. Backed by more than 150 family farms, six local granges and hundreds of local businesses, the bi-partisan campaign to protect family farmers from contamination by genetically engineered crops was approved by voters in every part of the county. The victory came despite almost $ 1 million in spending by Monsanto and other chemical corporations that have engineered GMO’s to withstand heavy herbicide spraying or produce their own insecticides. 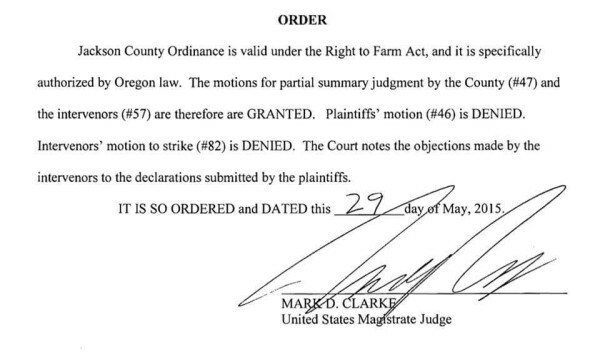 On November 18, 2014, two alfalfa growers raising Monsanto’s “Round-up Ready Alfalfa” filed suit against Jackson County arguing the Jackson County GMO ban (“the Ordinance”) violated Oregon’s Right to Farm Act. Media statements released when the farmers filed suit admitted the suit is being backed by a host of industrial interests. The Effect of Senate Bill 863: After the Jackson County Ordinance was proposed, the Monsanto front group, Oregonians for Food and Shelter, and other GMO-backers went to work in the Oregon Legislature attempting to prevent counties from voting to protect farmers growing traditional crops from banning GMO’s. The Legislature ultimately passed SB 863 to try to pre-empt other counties from banning GMO’s. But at the insistence of Sen. Bates and Rep. Buckley, a specific exemption for Jackson County was added into the law. Our Family Farms Coalition (“OFFC”), Center for Food Safety and farmers Chris Hardy and Elise Higley (Oshala Farm) were allowed to join the case as “Defendant-Intervenors” to help defend the Ordinance. Both the family farmers and Jackson County argued that the Right to Farm Act does not prohibit the Ordinance since it was adopted to protect traditional crops from being damaged by GMO’s.